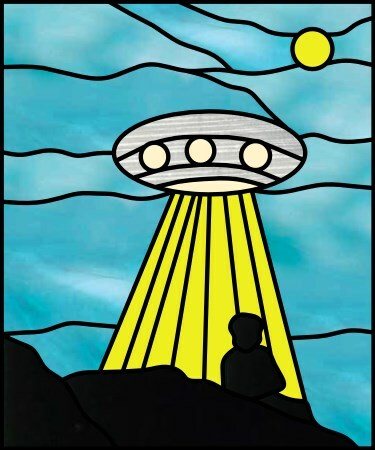 This design of a UFO and a boy was inspired by a strange encounter my husband had as a child. He was four years old when he encountered the UFO while playing outside. He said the UFO hovered for several minutes but disappeared when his mother came to check on him. This encounter has haunted and fascinated my husband his entire life. I started my design with a photo I found of a boy sitting on a hillside, and I rendered those images in silhouette form. I then drew the full moon and flying saucer using the drawing tools in Glass Eye 2000. I also used the software to add break lines into the scene. My husband requested that the UFO appear metallic, which I was able to do by using a suitable glass image from Uroboros. With the Color Selector in Glass Eye 2000 I was able to find just the right glass image very easily. Barbara Albright currently lives in Tulsa, Oklahoma. She took her first stained glass class (a Christmas present from her husband!) sixteen years ago in Wichita, Kansas and was immediately hooked. At that time she used preprinted patterns and copied patterns with carbon paper and poster board. Six years ago, her husband bought her Glass Eye 2000 to increase her productivity. She first practiced on the provided patterns to learn the basics such as changing glass colors and modifying designs. Later she learned how to import and trace scanned images. She especially likes the Glass Orientation feature of the Professional Plus Edition, which makes it possible to move and rotate glass images within a design to hide glass image repetitions and to make designs more realistic.